You know who I have an irrational dislike for? Katharine Hepburn. I know she’s one of the best respected and beloved actresses of all time, and the Oscar winningest lady ever, but she just drives me nuts. Admittedly I haven’t seen much of her work, but one film is all it took. In Bringing Up Baby she plays the lighthearted and carefree Susan Vance who drives the films comedy of errors with her impetuous, irresponsible, behaviour that we’re meant to take as cute and endearing. Every line she delivers just gets on my last nerve. Obviously this is some personal damage of mine, as the rest of the world seems to think it’s a pretty good film. Katharine Hepburn is a lot better in her more dramatic roles, but even there her upper class New-England accent chips away at my soul. I’m also a Star Trek fan, and Kate Mulgrew (Captain Janeway) who bears a strong resemblance to Katharine Hepburn, seems to have used Hepburn as the model for her character. Janeway has all the weird vocal ticks, the grandiose delivery of her lines, and the obstinate bullheadedness of so many of Hepburn’s characters. I can’t stand Janeway, and it turns out that she’s just a pale imitation of the grating irritation that Ms. Hepburn could bring to the screen. All that to say, I was predisposed to dislike Katharine Hepburn’s brownies, which are apparently her once-secret family recipe. The recipe starts by melting together butter with 2 ounces of chocolate in a double boiler, then stirring in sugar, eggs and vanilla. A quarter cup of flour and a bit of salt are then barely mixed in. A cup of chopped walnuts and folded into the batter, and everything goes into 325 oven for about 40 minutes. This is a very simple brownie recipe, unfortunately I thought they were awful. As the recipe promised the brownies were gooey-soft, which some people are really into, but it’s not my ideal texture. There were way too many nuts, which further weakened the integrity of these very soft brownies. They were hard to pick up without risking catastrophic brownie structural failure. My main complaint was that they hardly tasted like chocolate. 2 ounces was just enough to give the brownies a chocolate appearance, without any chocolate taste at all. Really they just tasted like sugar and walnuts. Unfortunately the gold standard for judging a brownie recipe is the ubiquitous boxed mix. Those boxed brownies are not bad, but any recipe you’re going to make yourself ought to be able to beat the pants off them. Katharine Hepburn’s brownies have conclusively failed that test. If you’re going to make brownies from The Book I’d suggest the Triple-Chocolate Fudge Brownies on page 689. I’ve made them a bunch of times, but haven’t blogged them because I’ve just replaced the three chocolates the recipe calls for with all semi-sweet. They’re seriously fantastic brownies, and they’d just destroy Katharine Hepburn’s mockery of a brownie in a head to head competition. Interestingly both Teena and Adam have made these brownies and given them grades of A- and A respectively. There are rave reviews for these things all over the internet, but they’re just not for me. These brownies just give me one more thing to dislike about Katharine Hepburn. This is quite funny. I must admit I have no opinions about Katherine Hepburn — but I might develop one if the brownies are awful. I know it’s irrational, I just can’t help myself. 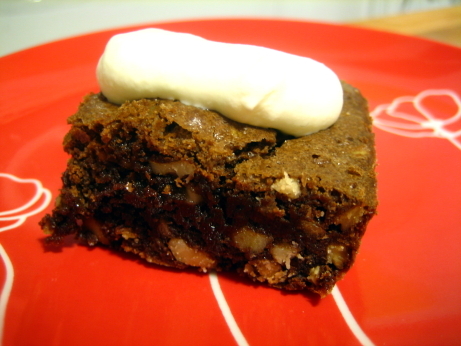 Just like Katharine Hepburn herself, these brownies are a timeless classic. Well the Hepburn factor certainly contributed to my rating. Had these been Patrick Stewart’s Brownies they probably would have earned 2 mushrooms. That is some quality irrational hate right there. Well done. Sorry, Kevin, but I have to disagree with you on both counts. Don’t write Kate off until you’ve seen Adam’s Rib, Desk Set, Guess Who’s Coming for Dinner and The African Queen. I’ve got to admit, though, that some of the things that grate on you about Hepburn are the very same things that I find endearing. As for the brownies, I stand by my post, but I haven’t tried the Triple-Chocolate Fudge Brownies yet, so you may still prove me wrong about which brownies are the best in The Book. I suspected you might. Luckily you seem to be in the majority on both the brownies and the actress. I’ve seen most of Guess Who’s Coming for Dinner, and it didn’t do it for me. I’ll give the films a try, or at least watch some youtube clips of her performances. I don’t think she’ll ever be the leading lady for me though. I prefer my Hepburn’s to be named Audrey. There are actually 4 brownie recipes in The Book, so each of us Gourmet Cookers could pick a different one as our favorite. Watch The Philadelphia Story before you rest your case about KH. I agree with you about the way she acts in Bringing Up Baby (though I like the movie in spite of it), and I’ve seen her in some stinkers, but that one shows her off the best, I think. That, and Stage Door. And I agree with Adam about Desk Set and The African Queen. Well, my grandmother is always looking for someone to watch old movies with, so maybe I’ll force myself to sit through a Katharine Hepburn marathon. I’m skeptical, but it wouldn’t hurt to give her another chance. like u could make brownies better! u need to just shut up and respect the brownies! Kate Hepburn is great in “Pat and Mike.” And I love her brownie recipe. They’re the only brownies I make anymore. They’re rich and mine hold together. A good example of a real woman.